Once again, Earth Mantra is very happy to welcome back ambient maestros Altus and Silvercord, this time with a re-release of their seminal 2006 collaboration Lullaby. As one might have noticed from reading our gushing reviews of their previous Earth Mantra albums, we are huge fans of both of these artists. One could expect that when two such amazingly talented musicians join forces that the results would be positively stunning. 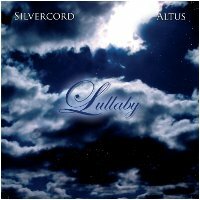 And with Lullaby, Silvercord and Altus do not disappoint. Some of the hallmarks of Silvercord's music are uplifting and achingly beautiful melodies and soundscapes. Likewise, Altus is beloved for his striking orchestrations, exquisite taste, and technical sophistication. Fortunately for the listener, their strengths complement each other flawlessly, resulting in an album that can only be regarded as a true classic. If you couldn't tell from the title, Lullaby has a strong thematic component, ostensibly intended to be music for children. Though the release can certainly be viewed as an album-length lullaby, definitely suitable for luring babies off to sleep, we find it to be a lullaby much more from the perspective of the parent not the child. Any dad or mom who has ever put a sleeping infant down to bed and then lingered quietly in the room with them for long minutes or hours to watch them sleep knows exactly what we're referring to. There is a tremendous peacefulness to the slumber of the very young, a delicate innocence that is so fragile and yet so very profound to experience. During those sacred moments, gazing down upon the easy rest of a child, a parent experiences a closeness, a tenderness, and a unity of spirit that is very difficult to find any other way. The parent's hopes and dreams are somehow amplified by the blissful and angelic sleep of the infant, all expressed in a single wordless moment. To us, the music in this beautiful album seeks to evoke this calm moment of perfection - and, in our opinion, it succeeds masterfully. For this is truly a gorgeous work, a classic collection of ambient lullabies that is essential listening for any ambient fan. We challenge anyone who has a child to listen to this album and not feel tears well up in their eyes at least once while listening. And folks without kids of their own will likewise find this album to be a deep, soothing, and sublimely relaxing listen. So it is with great pride that we unveil Lullaby on Earth Mantra, yet another superb release from our friends Mike Carss and Geoff Nostrant. Highly, highly recommended. Actually the main download delivers both the MP3 and the FLAC files, as part of one big ZIP file. That's why the download size is so much larger than the typical MP3 release. But I'll try to make that clearer in the description ongoing. Thanks! I look forward to a delightful listen. I am also delighted to get the full fidelity files instead of mp3. But, the note doesn't explain how to get them. I think that the main Download link delivers mp3. I found the flac files on the Internet Archive mirror. That's worth mentioning at the top, where people might see it before starting the download. Tnaks for all the good music. I've got all 120, and am in the long enjoyable process of listening to them all. This is beautiful! I'm so glad you got together on this one - a new genre is conquered! What a coincidence this being release the same time Jude was born. If you don't mind, I will send it to Mumz, Geoff, she will be so enthralled. Thank you as always, Silvercord, for great talent and hard work. And a big tip of the hat to Altus also. Great work!